More than 12,000 people, arriving from 127 countries, passed through the ECCMID exhibtion from April 21 to 24. 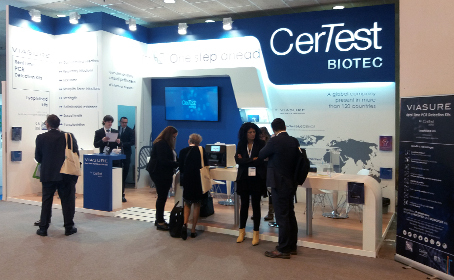 On this edition, 198 companies had a physical presence in the exhibition area, in which CerTest presented, as it has been usual for the last years, its latest releases and solutions for the diagnosis of infectious diseases, focused on its range of VIASURE products. With more than 75 references, VIASURE offers a complete panel of products to identify pathogens that cause gastrointestinal, respiratory, sexual or tropical diseases, among others. Since its founding in 1983, ESCMID has evolved to become Europe’s leading society in clinical microbiology and infectious diseases with members from all European countries and all continents. ESCMID is registered in Switzerland with offices in Basel. For more than 30 years, ESCMID has been an influential component in the professional lives of microbiologists and infectious disease specialists and now reaches more than 33,000 individual and affiliated members around the world. The appointment for next year, from 13 to 16 April in Amsterdam, Holland.